1. Preheat the oven to 150°C, gas mark 2. Grease and line a 20cm square cake tin with baking parchment. 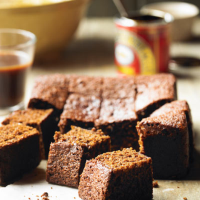 Heat the butter in a saucepan with the black treacle, golden syrup and sugar over a low heat until melted together. Remove from the heat and allow to cool slightly. 2. Sieve the flour with the ginger, cinnamon and bicarbonate of soda into a large mixing bowl then stir in the oatmeal. Make a well in the centre and gradually add the cooled syrup mixture, stirring and taking care that it doesn’t become lumpy. Stir in the egg and milk until it resembles the consistency of thick batter. Pour into the prepared tin and cook for 1-1¼ hours until just firm to the touch. Leave in the tin to cool completely (don't worry as it will sink in the middle as it cools). Remove from the tin and cut into pieces. Store in an airtight tin for up to a week, if you wish, before serving.